MILPITAS, CA--(Marketwired - Jan 24, 2017) - ABBYY®, a leading provider of technologies and solutions to action information, today announced the availability of FineReader 14, the next version of its flagship desktop software that combines award-winning optical character recognition (OCR) with advanced capabilities for working with PDFs and document comparison. With the new version, business professionals can easily manage and accomplish all kinds of daily tasks -- editing, converting, commenting and comparing documents -- using one, intuitive application. FineReader 14 comes with the main functionality required to work with any paper-based document and PDFs, whether scanned or digitally created. "Paper continues to remain a key component of business workflows. An IDC survey1 in the U.S. has confirmed that 65 percent of organizations are still heavily dependent on paper requiring greater efforts to transform information for further use," says Ivan Bodyagin, vice president of the FineReader Product Department at ABBYY. "By leveraging more than 20 years of experience in OCR development, ABBYY is bridging the gap between paper-based and digital information, providing a powerful tool to streamline document-driven processes." Highly accurate conversion of PDFs and scans into actionable formats: Ongoing improvements to ABBYY's OCR technology ensures that it continues to deliver exceptional results for converting scans and PDFs to editable and searchable formats such as Word, Excel®, PowerPoint® and PDF, while retaining all the original features that FineReader is renowned for, such as extended OCR capabilities and automated conversion. PDF editing and collaboration: FineReader 14 is an all-in-one solution for working with PDFs and scans, with built-in advanced editing and collaboration tools for managing pages, content editing, reviewing, commenting, searching, filling forms, signing and protecting files. Cross-format document comparison: An all-new "compare documents" feature detects and highlights any relevant textual changes between two versions of the same document, regardless of whether their format is PDF, Word, JPG, etc. Deep OCR integration into PDF tools: FineReader 14 is the product of choice for those who work with scans and paper-based PDFs on a daily basis due to its ability to automatically apply OCR to PDFs when required. Over 190 OCR languages: New version supports text recognition in more than 190 languages, including some difficult-to-digitize languages such as Korean, Chinese, Japanese and Arabic. It also comes with support for simple math formulas and English phonetic transcriptions. 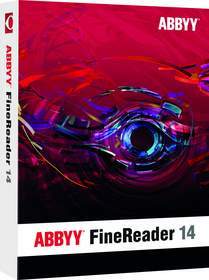 ABBYY FineReader 14 is available immediately in three editions: Standard, Corporate and Enterprise, worldwide. It can be ordered through online stores and many retail outlets. For detailed product information and available versions, visit www.abbyy.com/finereader. ABBYY is a leading global provider of technologies and solutions that help businesses to action information. The company sets the standard in content capture and innovative language-based technologies that integrate across the information lifecycle. ABBYY solutions are relied on to optimize business processes, mitigate risk, accelerate decision making and drive revenue. ABBYY technologies are used and licensed by some of the largest international enterprises and government organizations, as well as SMBs and individuals. The company maintains offices in Australia, Canada, Cyprus, France, Germany, Japan, Russia, Spain, Taiwan, UAE, the UK, Ukraine, and the United States. For more information, visit www.ABBYY.com. ABBYY and the ABBYY, ABBYY Logo, FineReader, ABBYY FineReader are either registered trademarks or trademarks of ABBYY Software Ltd. Other product names mentioned herein may be trademarks and/or registered trademarks of their respective owners and are hereby recognized.